Yolan Cris is a high end, high fashion wedding dress designer. The brand was founded in 2005 by two sisters, Yolanda and Cristina, who were born in Barcelona. Creative directors and the soul of the brand, together they have built Yolan Cris to be a world leader in bridalwear and occasion wear. With the same energy and efforts as they had right at the beginning, Yolanda and Cristina continue to remodel, modernize and rebuild the collections with personality and creativity. Supported by their team from the word go, the designs have become renowned for their hand made quality and reliability. With added value from orginiality and innovation from new dress designers, the brand is always moving forwards with one foot in the present and new steps forward every day. 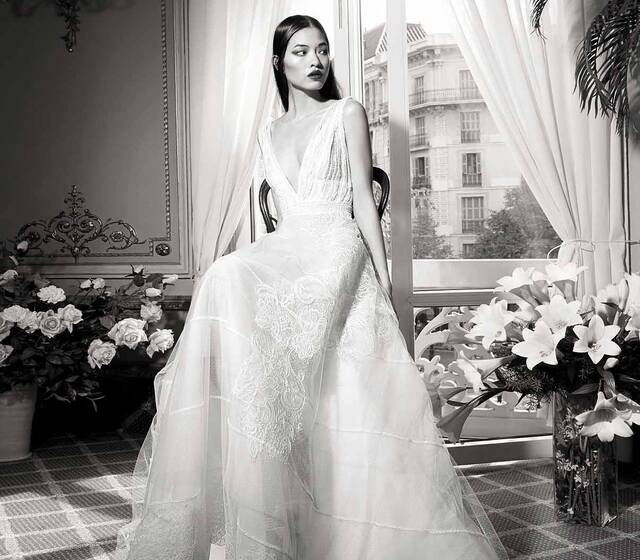 Modern, sensual, and unique, this rising Spanish bridal brand is turning heads with gorgeous wedding gowns. Spain has invaded the US - with bridal designers! These names may be familiar to you, but if not, you´re about to discover a whole new world of beauty, grace, and sensuality.